The Nichi Bei Foundation is an educational and charitable nonprofit organization dedicated to keeping the Japanese American community connected, informed and empowered — primarily through a community newspaper (Nichi Bei Weekly) and Website (www.nichibei.org), as well as educational programming. The Nichi Bei Foundation is an innovative nonprofit educational organization, rising out of the ashes of a community-serving media legacy dating back to 1899 to launch the first nonprofit ethnic community newspaper of its kind in the country. It strives to be the glue that holds the community together, helping to preserve Japanese culture while shedding light on community issues and documenting the community’s history for generations to come. • Japanese Culture and Cherry Blossom Festivals Guide. The only annual guide to Japanese culture in the country, this special publication highlights Japanese cultural centers and springtime festivals throughout the country. In an effort to preserve Japanese culture, special features on cultural arts as well as extensive class listings are included. • Obon and Summer Festivals Guide. The only annual guide to Japanese summer festivals throughout the country. • Japanese American Community Resource Guide. Featuring maps and historic walking tours of the last three remaining Japantowns, a directory of community-based nonprofit organizations in California, a Japanese Language School Directory, historical destinations, a guide to community centers and senior centers, and cultural arts class listings. • San Francisco Japantown Map and Directory. The most comprehensive map and bilingual directory of Japantown. In 1899 legendary newspaperman Kyutaro Abiko — known to historians as the most influential Japanese immigrant to America — established the Nichi Bei Shimbun, which would become the most influential Japanese American newspaper in the country prior to World War II. Abiko, who also founded three Japanese American farming colonies in California’s Central Valley, encouraged Japanese immigrants to settle in their adoptive country, and to rebuild their lives in America. 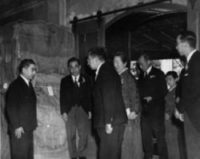 After the war, some former staff of the Nichi Bei Shimbun came back to establish the Nichi Bei Times with the goal of getting the community reconnected after their devastating incarceration in wartime concentration camps. 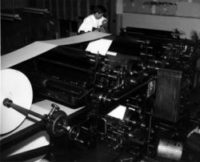 Led by Shichinosuke Asano, a protege of Takeshi “Kei” Hara — the first commoner prime minister of Japan — the first issue of the Nichi Bei Times rolled off the presses on May 18, 1946. The early pages were used by Asano to raise awareness of and funds for postwar relief efforts in Japan, and the newspaper would help in obtaining redress for the community for their wartime incarceration. As the Nichi Bei Times board of directors decided to close the newspaper after 63 years in September of 2009, a group of Nichi Bei Times staff and contributing writers, media professionals and community leaders — encouraged and supported by the Japanese American community — set out to rebuild in the spirit of the Issei, brick by brick. They established the Nichi Bei Foundation, an educational and charitable nonprofit organization, as a means to support community organizations, shed light on community issues and document the community’s history. Just one week after the last edition of the Nichi Bei Times rolled off the presses, the very first edition of the Nichi Bei Weekly was published as the first ethnic nonprofit newspaper of its kind in the country. Born in one of the worst economic climates in decades, with virtually no seed money, the pioneering rebirth of the Nichi Bei Foundation and the Nichi Bei Weekly has become one of the most inspired community movements in recent memory. Inspired by a community-serving historical legacy, the Nichi Bei Foundation and the Nichi Bei Weekly have a simple yet profound mission: to keep the community connected, informed and empowered. Read Board of Directors Bios here.